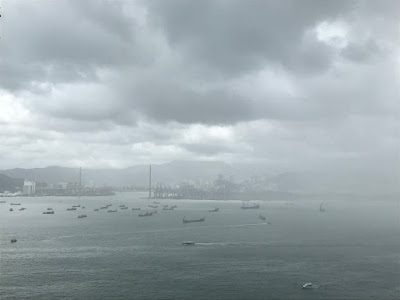 The view of Victoria Harbour for most of the day -- rain! Today was particularly wet for most of the day -- the remnants of Typhoon Maria (that already landed in Fujian province in southeast China) are affecting us in Hong Kong. Many people on social media took pictures of themselves, remorseful they forgot to bring an umbrella with them. Throughout the day it was torrential rains for several minutes and then it would stop for a while, then the heavy rains were back at it again. I ventured out in the morning and just when I made it to the wet market, there was a downpour and it dried up by the time I got home. Again in the early evening I caught a bus from Central to have dinner with my relatives in Kowloon. When the bus got to Wan Chai, there was heavy rain again and luckily I had an umbrella with me. But this time the rain would not stop when I arrived at my stop in Tokwawan. To pass the time I popped into a grocery store to pick up a few things and when it wasn't so heavy, I made it to my relatives' home not too soaked. The rains remind me of Singapore where it will pour for five to 10 minutes and then stop and even the sun makes an appearance. Does this mean Hong Kong's weather is turning into something similar to the Lion City's?